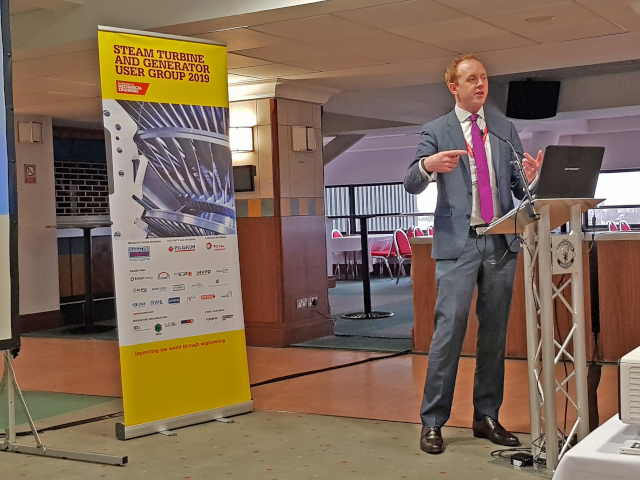 Earlier this month, Electrical Engineer Ben Adams of Hawkins’ London Office, presented at the IMechE Steam Turbine & Generator user group annual conference. This is an annual conference, and this year had over 200 attendees from across the world, from operators, manufacturers, service providers and insurers. Ben has been on the organising committee for this conference for the past 7 years. Ben is the leader of a CIGRÉ (International Council of Large Electric Systems) working group on Rotating Electrical Machines, and he presented a tutorial on the subject of whether high speed testing of turbines is required after maintenance. Ben starting the working group to provide some guidance on the controversial subject of whether generator rotors should be balanced or not following rewinds. This presentation covered the pros and cons of carrying out the testing, which is only available at a small number of specialist facilities around the world. The presentation also provided a risk matrix to aid with decision making. Balancing the rotor is considered to be a generally lower-risk option, but it is both costly and can add months onto the repair program. The paper aims to act as a guide to allow operators to make better, informed decisions on what is right for them. If you would like to schedule a presentation from an electrical engineer at your office, please contact us.